All of our tents can be equipped with Cathedral Windows, allowing for both privacy and visibility as needed. Graham Bauckham is the owner of Varsity Tents, an event rental company in Toronto providing all event rental items such as tents, furniture & more for special events, weddings and corporate functions. We have an extensive quote form here, and the more you can tell us about your event the better. Once we receive your form, one of our senior tent pros will contact you within 24 hours with your estimate. Learn more about us. Since 1988, we’ve put up well over 30,000 tents, from simple backyard parties to complex festivals with hundreds of installations. Let the experienced team at Varsity Tents help make your event one to remember. 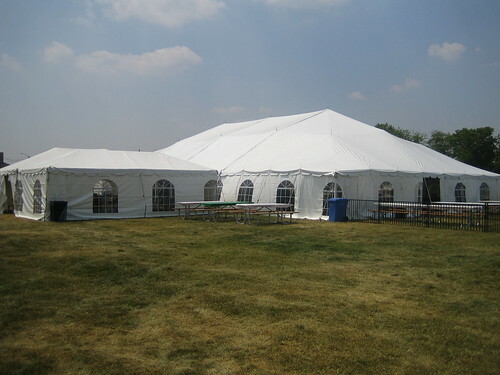 Varsity Tents: Whatever your event… We’ve got you covered! Every event, whether it’s an intimate backyard barbecue, an elegant wedding, a corporate function or an outdoor festival, is brought to life by hard-working people who are responsible for the success of that event. These people are, if only for one day, event planners, and we treat their events just as we do those of professional planners: the stakes are high and reputations are on the line. Click here to read the rest of our manifesto and learn about our seven guiding principles.